Nothing says winter is upon us like the sight and smell of evergreens. 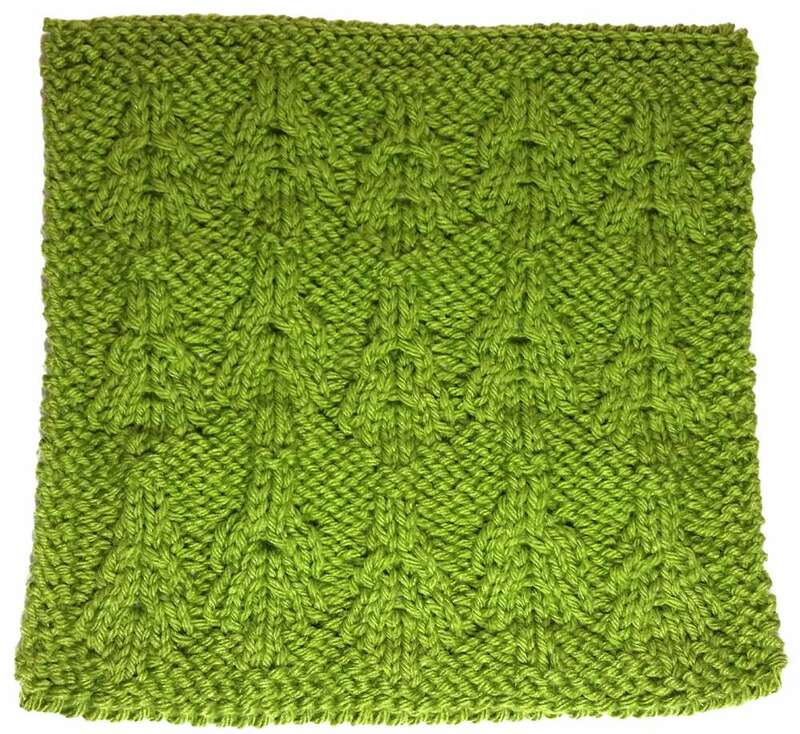 How appropriate to celebrate the season with a stitch square that echoes those majestic, green forests. 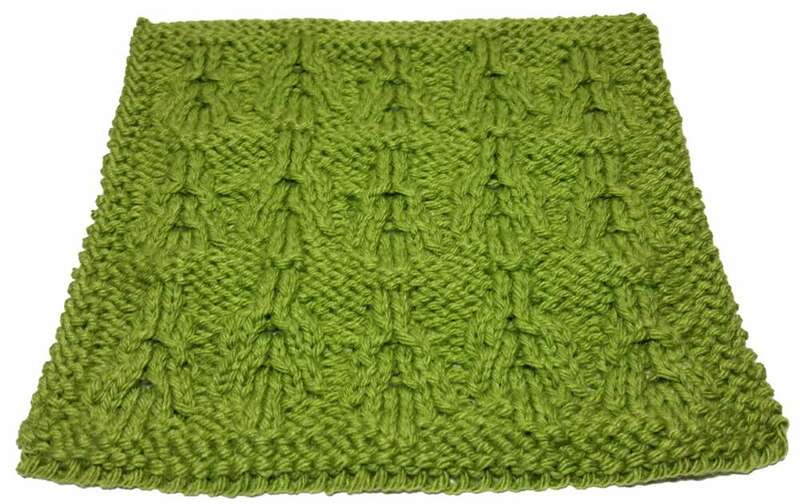 This stitch has some simple twists and 2 over 1 cables, along with a few shaping stitches to help create the illusion of evergreen boughs. [yo, k2tog]: From left to right, worked over 2 pegs: Move the loop from the yo peg to the k2tog peg. Using the working yarn, e-wrap the empty yo peg. 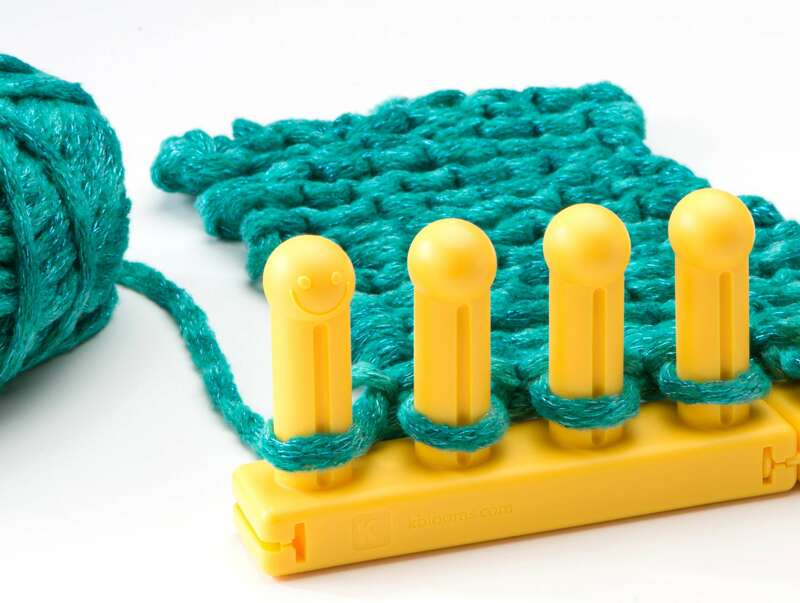 Knit the k2tog peg, working the 2 loops as one. [k2tog, yo]: From right to left, worked over 2 pegs: Before working the k2tog peg, move the loop from the yo peg to the k2tog peg. 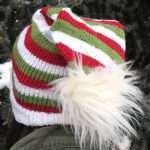 Knit the k2tog peg, working the 2 loops as one. E-wrap the empty yo peg. [ssk, yo]: From left to right, worked over 2 pegs: Before working the ssk peg, move the loop from the yo peg to the ssk peg. Knit the ssk peg, working the 2 loops as one. E-wrap the empty yo peg. 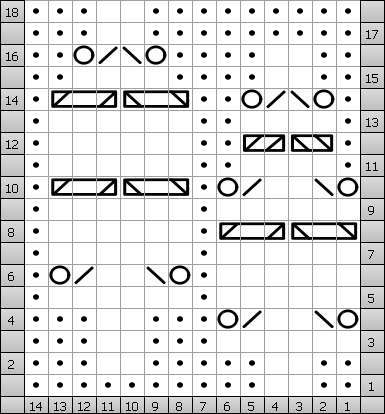 [yo, ssk]: From right to left, worked over 2 pegs: Move the loop from the yo peg to the ssk peg. Using the working yarn, e-wrap the empty yo peg. 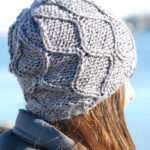 Knit the ssk peg, working the 2 loops as one. 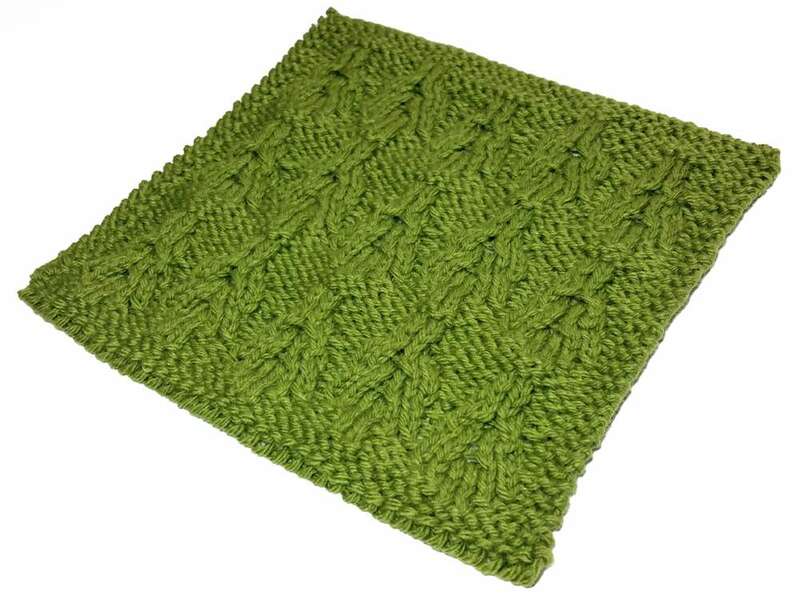 The cables in this pattern include both 2 peg twists and 3 peg cross overs. 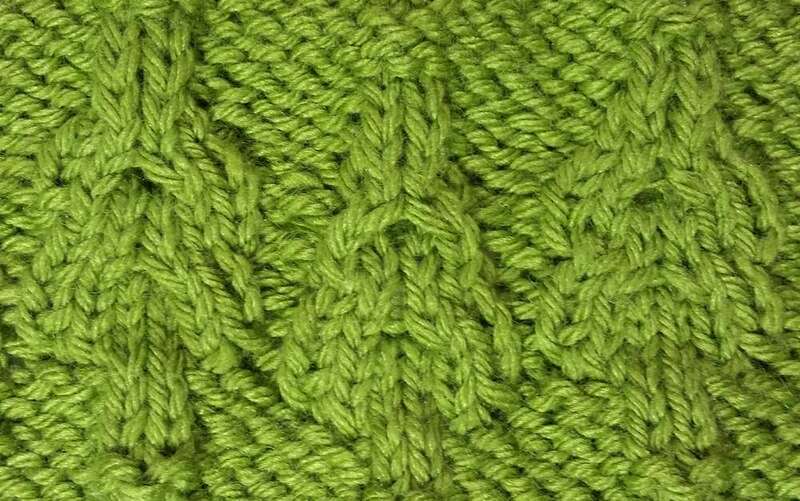 • Move the two stitches on the left of the designated cable pegs over one peg to the right. • Move the two stitches on the right of the designated cable pegs over one peg to the left. Row 1: p2, k2, p10. Row 2: p3, k2, p5, k2, p2. Row 3: k6, p3, k2, p3. Row 4: p3, k2, p3, yo, k2tog, k2, ssk, yo. Row 5: k6, p1, k6, p1. Row 6: p1, yo, k2tog, k2, ssk, yo, p1, k6. Row 7: k6, p1, k6, p1. Row 8: p1, k6, p1, 2/1RC, 2/1LC. Row 9: k6, p1, k6, p1. 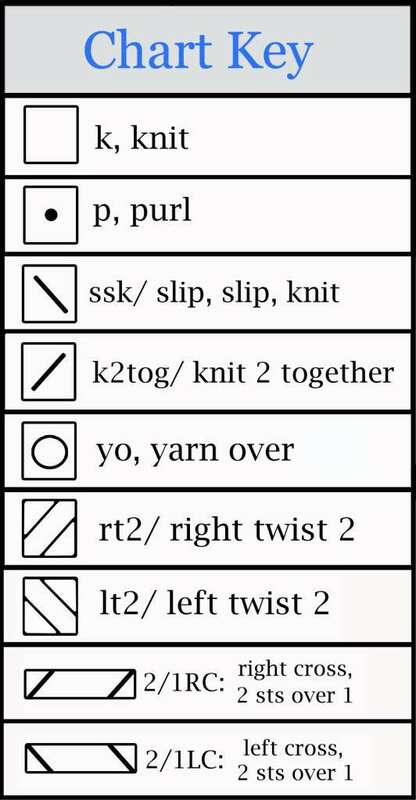 Row 10: p1, 2/1RC, 2/1LC, p1, yo, k2tog, k2, ssk, yo. Row 11: p1, k4, p2, k6, p1. Row 12: p1, k6, p2, rt2, lt2, p1. Row 13: p1, k4, p2, k6, p1. Row 14: p1, 2/1RC, 2/1LC, p2, yo, k2tog, ssk, yo, p1. Row 15: p2, k2, p4, k4, p2. Row 16: k2, yo, k2tog, ssk, yo, p4, k2, p2. Row 17: p9, k2, p3. Row 18: p3, k2, p9. Row 4: k2, p3, *k2, p12, repeat from * once, k2, p3, k2. Row 5: p5, *k2, p5, repeat from * to end. Row 6: k2, p1, k6, *p3, k2, p3, k6, repeat from * to last 3 sts, p1, k2. Row 7: p3, *yo, ssk, k2, k2tog, yo, p3, k2, p3, repeat from * once, yo, ssk, k2, k2tog, yo, p3. 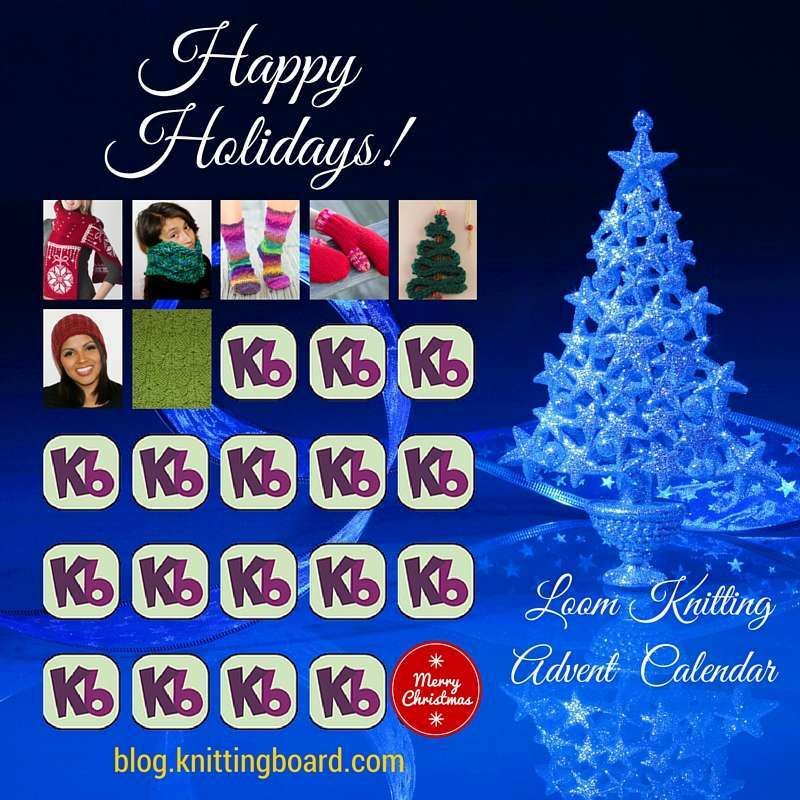 Row 8: k2, p1, *k6, p1, repeat from * to last 2 sts, k2. Row 9: p3, k6, p1, *yo, ssk, k2, k2tog, yo, p1, k6, repeat from * to last 3 sts, p3. Row 10: k2, p1, *k6, p1, repeat to last 2 sts, k2. Row 11: p3, *2/1LC, 2/1RC, p1, k6, p1, repeat from * once, 2/1LC, 2/1RC, p3. Row 13: p3, *yo, ssk, k2, k2tog, yo, p1, 2/1LC, 2/1RC, p1, repeat from * once, yo, ssk, k2, k2tog, yo, p3. Row 14: k2, *p2, k4, p2, k6, repeat from * once, p2, k4, p2, k2. Row 15: p4, *lt2, rt2, p2, k6, p2, repeat from * once, lt2, rt2, p4. Row 16: k2, p2, *k4, p2, k6, p2, repeat from * once, k4, p2, k2. Row 17: p4, *yo, ssk, k2tog, yo, p2, 2/1LC, 2/1RC, p2, repeat from * once, yo, ssk, k2tog, yo, p4. Row 18: k2, p3, *k2, p4, k4, p4, repeat from * once, k2, p3, k2. Row 19: p5, *k2, p4, yo, ssk, k2tog, yo, p4, repeat from * once, k2, p5. Row 20: k2, p10, k2, p12, k2, p10, k2. Row 21: p12, k2, p12, k2, p12. 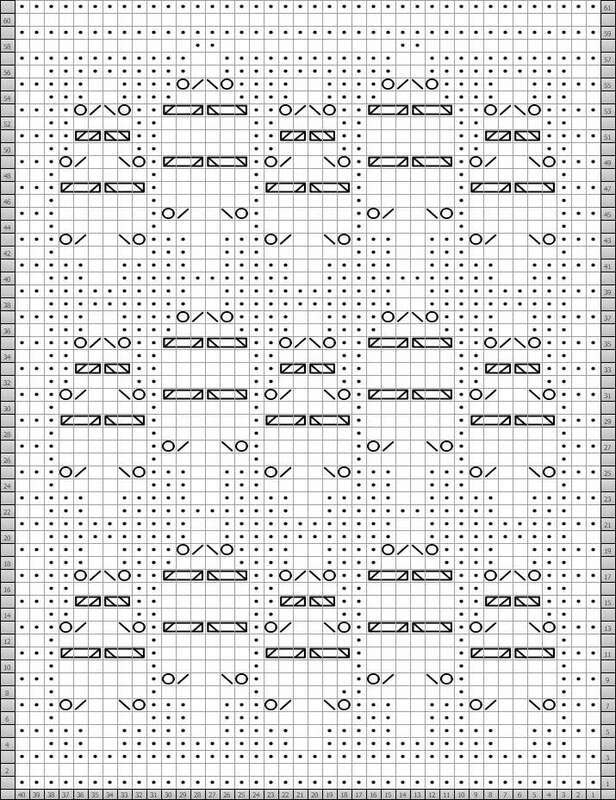 Rows 22-57: repeat rows 4-21. Row 58: k12, p2, k12, p2, k12.